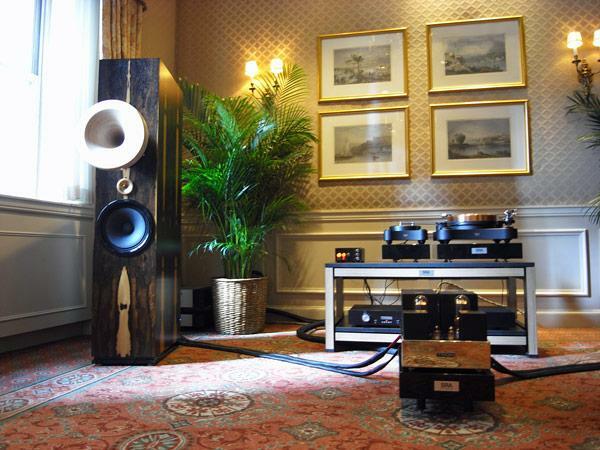 High Water Sound, the New York City-based retailer and distributor, created one of my favorite demonstrations at the show, as much for proprietor Jeffrey Catalano's choice of musicGabor Szabo's instrumental version of Donovan's "Three King Fishers" was playing when I came inas for the exotic and unassailably musical system on display: TW Acustic Raven Black Night turntable ($40,000) and 10.5 tonearm ($5500), Tron Seven GT line-level preamp and phono preamp ($18,000 each), Tron Telstar 211 SET amplifier ($40,000), and the striking Affascinate loudspeaker ($62,000) from Cessaro Horn Acoustics, the latter using an 11" woofer in a back-loaded horn, a proprietary compression driver for the spherical midrange horn, and a modified horn-loaded TAD beryllium tweeter. The sound was tactile, impactful, and thoroughly involving on every recording I heard. From an email’s distance, Jeff Catalano and his dealership High Water Sound seemed an enigmatic business in my mind, selling esoteric hi-fi from a downtown NYC loft. So, I was a little intimidated to visit his room, but to my surprise, Catalano is as non-elusive as you can get, beaming with joy about hi-fi and music and even wearing a Triumph shirt(! ), the true sign of an everyman. He tells me he is committed to selling gear that brings the most emotion out the music. 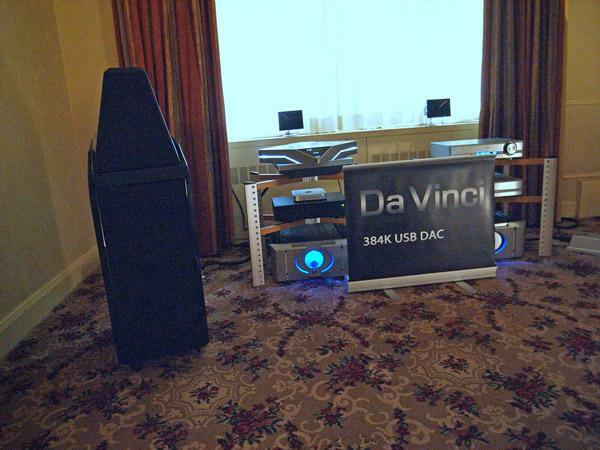 I had seen and heard a prototype of the Light Harmonic's Da Vinci DAC at the 2011 Axpona Show, but the 2012 NY Show saw the debut of the production version of this unique $20,000 DAC, which handle data with sample rates up to 384kHz over an asynchronous USB 2.0 link. 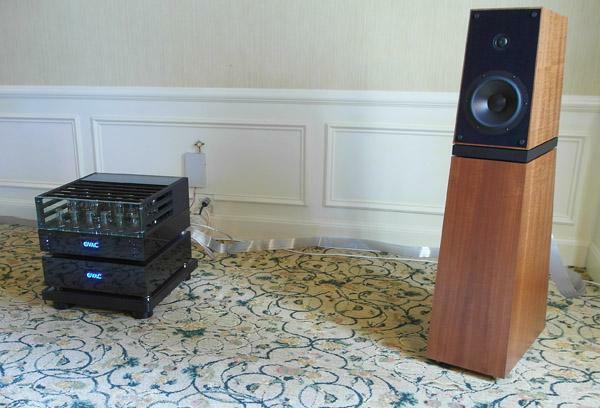 Demmed in a system comprising Wilson Sasha W/P speakers, driven by a Pass Labs X100.5 amplifier and XP20 preamp, with all-MIT cabling, wit data sourced from an iPad-controlled Mac mini, the Da Vinci produced a sound that thrilled. A 384k-sampled recording of voice and acoustic guitar by Cookie Marenco sounded palpably real. I am planning on reviewing the Da Vinci in the late fall. 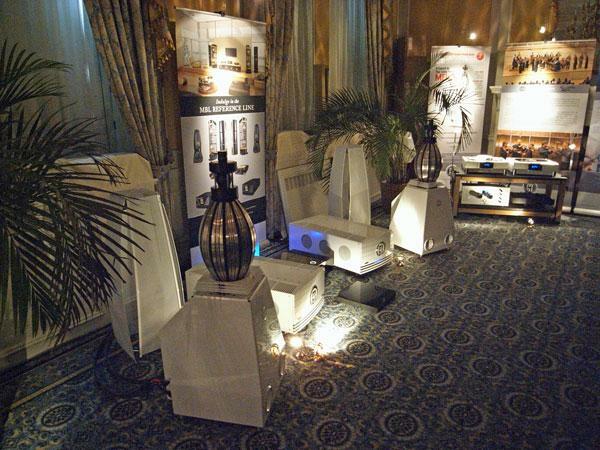 As well as providing the sound for the seminar room, which was where a recorded music concert, titled "Euphoria at the Waldorf," was presented Friday and Saturday evenings, The Tweak Studio's exhibit room also featured components from the premium German manufacturer Burmester: a pair of 380 Mk.2 speakers driven by a 911 power amplifier and an 088 preamp. 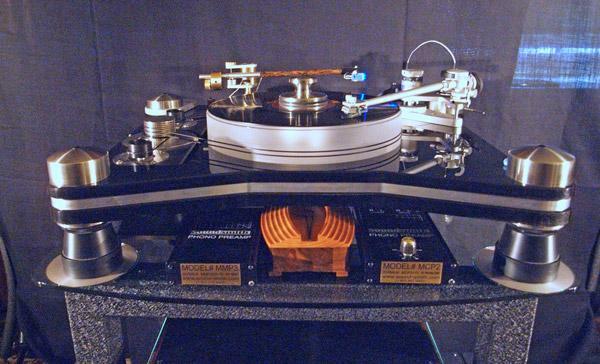 Source was a Walker turntable and arm fitted with a Soundsmith Sussuro Hyperion cartridge. There was much to admire in this system's reproduction of Louis Armstrong singing "St. James Infirmary," but as was the case with so many of the rooms at the Waldorf, the presentation was marred by over-ripe room acoustics. 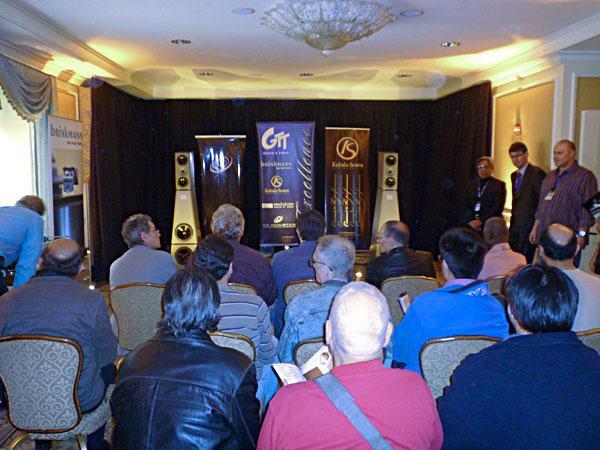 The MBL room was the last room I visited at the NY Audio & AV Show. 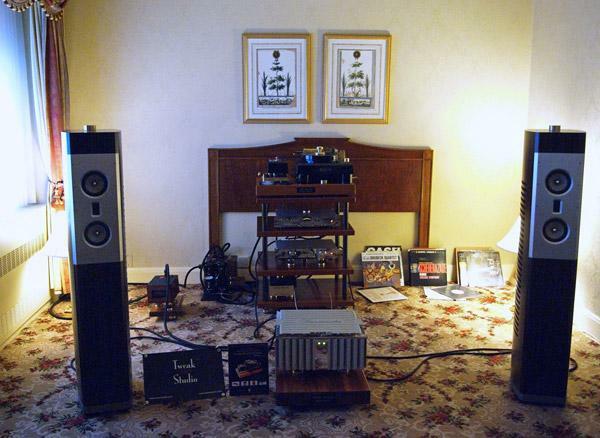 I sat down in the sweet spot, on the couch midway between the MBL 101E Mk.2 "radialstrahler" speakers, each driven by a 9011 monoblock; Jeremy Bryan cued up a hi-rez file of Peter Gabriel singing "Wallflower," from his New Blood album; and OMG. This was true virtual reality! 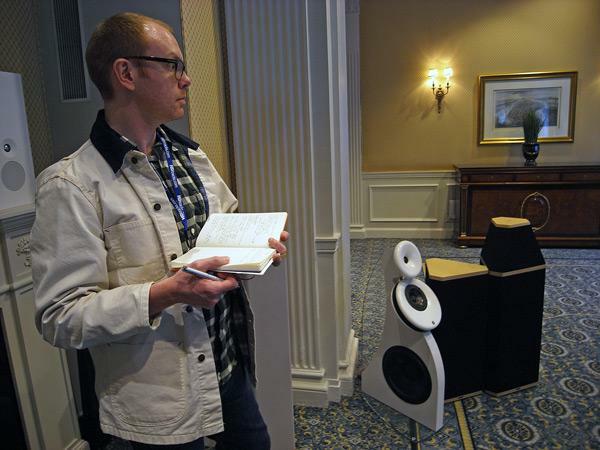 Then Jeremy explained what he had to do to tame the room's acousticssee Ariel Bitran's blog following this one. All I can say is that it was worth the effort! Long lines flooded out of the MBL room on the 18th Floor of the Waldorf=Astoria all weekend long, so I arrived at 9:30am on Sunday morning to see if I could get a good listen to the MBL system by myself. 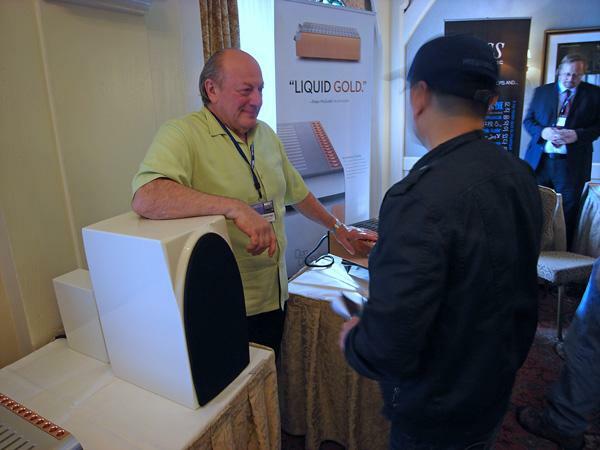 Upon arrival, MBL North America’s representative, Jeremy Bryan, was still setting up his smaller speakers, the mbl 120 Radialstrahler ($21,400/pair, without stands) along with their mbl C21 stereo power amplifier ($9200), mbl C11 preamplifier ($8,800), and mbl C31 CD player ($9,200), all members of their Corona line of electronics. 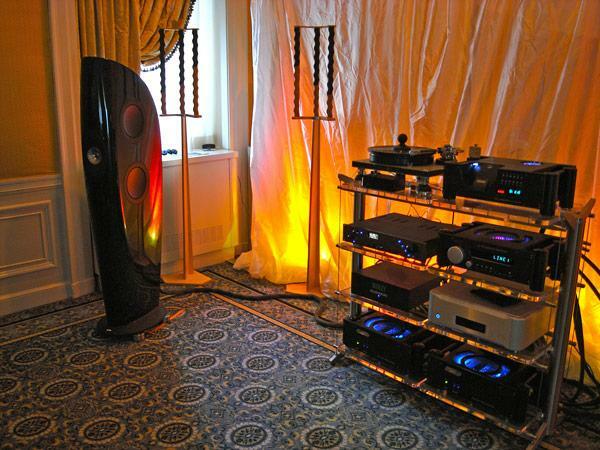 I had visited the Legacy room at the NY Show hoping to hear the Whisper XD, which had been one of my best sounds at the 2010 Axpona Show. 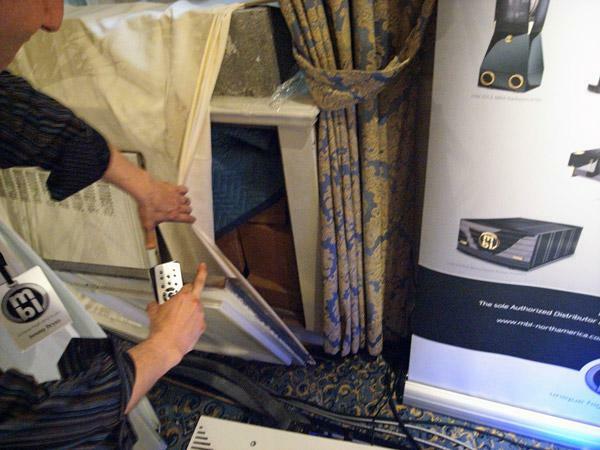 Though I have auditioned this speaker at other shows since then, they had never been set up in rooms that did them justice. 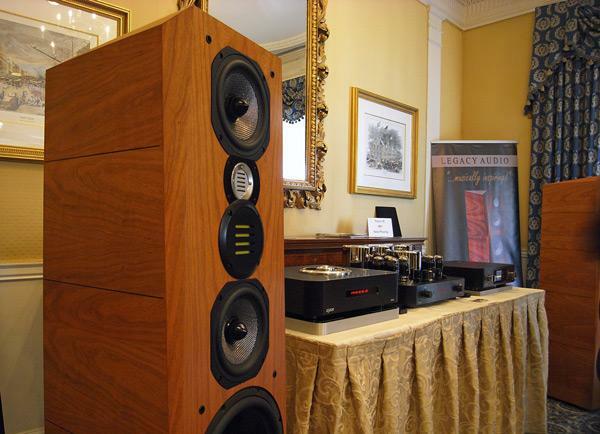 However, when I visited the Legacy room, the relatively affordable Focus SE speakers ($8750$9250/pair, depending on finish), set up at the other end of the room from the Whispers, were playing. Driven by Ayon tube amplification, this speaker, which combines a 1" Kapton ribbon tweeter with a 3" Kapton-ribbon midrange unit, two Rohacell-reinforced graphite-cone woofers, and two 12" aluminum-cone subwoofers sounded pleasant enough, but the listening conditions were not sufficiently ideal for me to make a more confident judgment of the speaker's quality. 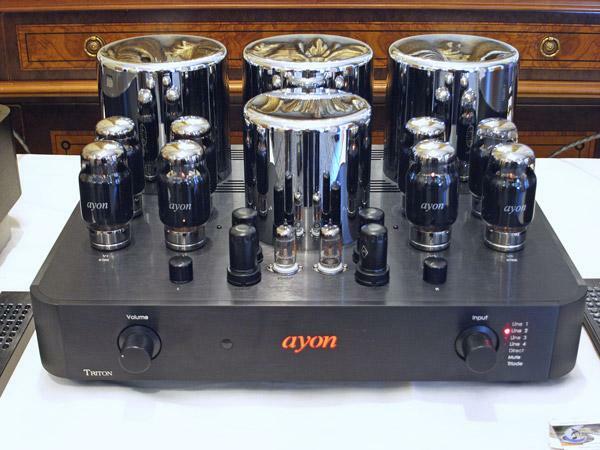 Driving the Legacy Focus SE speakers was this beautiful tube integrated amp from Ayon, the Triton 3 ($12,000). 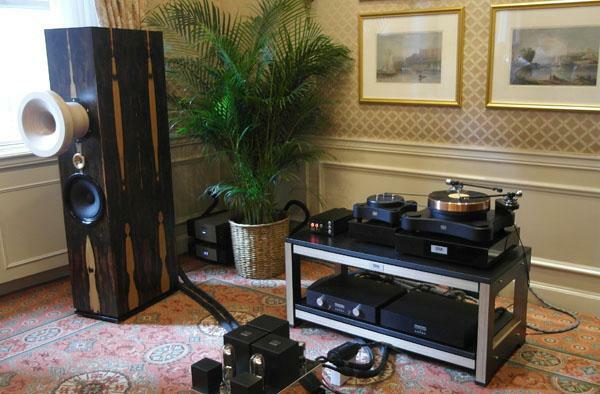 Ayon's S3 Streamer ($8800) combines a DAC with a tubed preamp stage.